Contine vitamine,amino-acizi,fosfor organic care formeaza Butaphosphene,ajuta ficatul dupa efort, recomandat si dupa boala. In perioada naparliri d e 2-3 ori in fiecare saptamana combinat cu Taubengold. 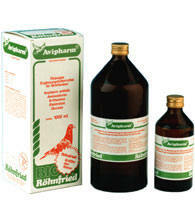 Liquid feed supplement for pigeons. AVISAL contains vitamins, amino-acids and the organic phosphorus compound Butaphosphene. AVISAL is intended for use as a feed supplement for the nutritional maintenance of a healthy metabolism. Administration of AVISAL is important during the breeding season. It facilitates egg laying and supports the rearing of the youngsters. Prior to and during the racing season. AVISAL will help overcome over-exertion and exhaustion, and will enhance muscle performance. Administer together with Taubengold during the moult for good plumage.
. Measurement is 10 ml (= 2 caps) in 1 liter of drinking water for 20 pigeons.
. During the breeding season - Administer 2 times per week.
. After flights - On the 1st and 2nd day after return.
. Moulting period - 2-3 times every week in combination with Taubengold. Administrare:1 masura la un 1 litru de apa sau 2 masuri la 1 kg de mancare,Se folosestre in timpul cresteri puilor, curselor si in perioada de naparlire. Pentru recuperare si fortificare - aminoacizi, electroliti, glucoza si complex B. Mentine in limite normale flora intestinala mai ales dupa efort (ficat) si tratamente. 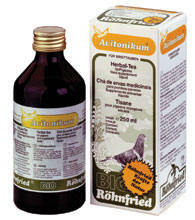 Liquid feed-supplement for pigeons. AVIPHARM contains amino acids, electrolytes, glucose and vitamins of the B-complex. All these componentes are causing a good moulting and a strong growing of the young pigeons during the breeding-time. AVIPHARM serves for strengthening after races, promote the function of the liver and activate the metabolism by contaminations and after the time you give antibiotics.
. 20 ml (= 4 full screw-caps) with 1 liter drinking-water. Bathing salts for pigeons. Bathing is a necessity for the health of sporting pigeons all year round. 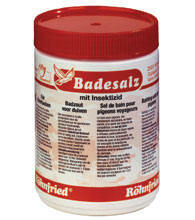 Especially during the moulting period, Rohnfried-bathing salts removes dust, skin residues, and skin flakes quickly and dependably. Feathers and down of undesirable quality are loosened, furthing the moulting process.
. Add 1 measuring spoon, approx. 20 g, of bathing salts to 10 liters of bathing-water.
. Depending on the weather, pigeons should be offered a bath once or twice a week. Administrare:-2 ml la un litru de apa. 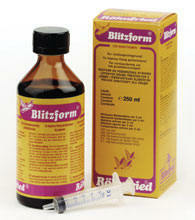 Blitzform Solution is a preparation that enhances performance and preserves health. It contains iodine to stimulate the metabolism and thyroid function and active iron for formation of red blood corpuscles. This improves oxygen uptake in the blood.
. 2 ml per 1 liter of water several times a week. Este un preparat format din 18 vitamine se administreaza in apa sau mancare pentru a preveni deficientele de vitamine pe toata perioada anului. Administrare:10 ml la 2 litri de apa sau 1,5 kg de mancare de 1-2 ori pe saptamana. The multivitamin preparation GERVIT-W contains 18 vitamins and is administered together with water or grain feed to prevent vitamin deficiency symptons during breeding, racing, molting and exhibition periods. Administer 10 milliliters in 2 liters of drinking water or 1.5 kg of grain feed for 1 to 2 times per week. 100% natural, contine iod, magneziu, calciu, argila si drojdie de bere. Nu trebuie sa lipseasca din crescatorie. The Lecker-Stein is a special stone pigeons love due to its special formula. Besides the essential minerals, the Lecker-Stein contains magnesium and iodine. The special production method and grain of the material make this a delicacy for pigeons. 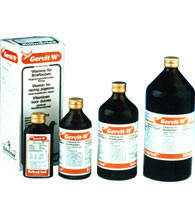 -Packages: cartons with 6 pcs. and 10 pcs. Este o sursa energetica concentrata care asigura performanta.Contine maltodextrin si fructose, o combinatie de substante care furnizeaza recuperarea rapida de energie. Se administreaza inaintea cursei pentru a creste performanta si a oferi o recuperare rapida. Malto Dextrin, Glucose, Fructose, Trikaliumcitrat, Magnesiumcarbonat, Citronensaure, Vitamin C, Nikotinsaure, Vitamin E, Calcium-d-pantothenat, Vitamin B6, Vitamin B2, Vitamin B1, Biotin, Vitamin B12, Folsaure. Administrare:Se administreaza 10 grame ( 2 linguri de masuta pline) la un 1 litru de apa 2-3 zile inaintea cursei pentru crestere energiei si glycogen in muschi.Dupa cursa se administreaza pentru recuperare rapida 1-2 zile.Forte important. Ahighly concentrated energy source for top performance. 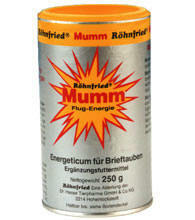 MUMM contains maltodextrin and fructose, a combination that delivers both readily available and long lasting energy. For this reason, MUMM should be administered before flights to increase performance and after flights for quick recovery. Administer 10 grams (2 full measuring spoons) to 1 liter of drinking water 2 to 3 days prior to flights, to build up energy and glycogen in bird's muscles. Provide clear drinking water only, on racing day. Following return, for rapid recovery, administer MUMM for 1 to 2 days. Very important! 100% natural - aminoacizi, 8 elemente poteice, arginina, lisina si drojdie de bere, ajuta la recuperare. A special brewer's yeast of great biological value. It contains zymocasein and cerevision, two protein building blocks contained in all essential amino acids. 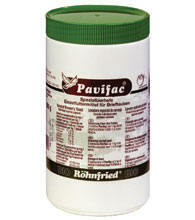 Rohnfried PAVIFAC is enriched with pollen and citric acid, making it particularly well suited as an enriching additive to grain feed.
. Administer 2 grams per 1 kg of feed, 1 to 2 times per week. Contine toate mineralele vitale cuma ar fi: Calciu,Fosfor,Sodiu,Magneziu,oligo-elemente Zinc, Fier,Mangan,Iod, Cobalt,Cupru, si vitaminele A, D3,complexele de vitamine E+B. 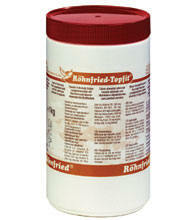 Rohnfried TOPFIT feed lime contains all vital minerals such as calcium, phosphorus, sodium and magnesium plus the trace elements zinc, manganese, iron, copper, iodine, cobalt and vitamin A, D3, E+B complex.
. Provide to pigeons in a small container for unrestricted feeding or mixed in with feed.
. 20 grams in 1 kg of gram feed. Contine extracte distilate din diferite plante, aceste uleiuri mentin organele respiratorii sanatoase si cresc rezistenta porumbelului la curent si frig. Contra Trihomonozei ,necesar in cresterea performantei porumbeilor si evita mortalitatea lor. Este de neinlocuit in perioada de recuperare a porumbeilor. Contine calciu,fosfor,vitamine,cel mai important este DL-methione- un aminoacid care contine sulf organic.